Since they can often be seen growing wild, blackberry and raspberry bushes may seem easy to maintain. To some extent this is true. While blackberry and raspberry bushes do not require the amount of care that ornamental plants and some other fruiting plants do, they do require some amount of pruning. When you prune blackberry and raspberry bushes, it not only keeps them healthy and attractive, but actually helps the bushes yield more fruit. Trim back primocanes when they have reached a height between 30 and 36 inches each spring, between mid-March to mid-April, before the growing season begins. Cut the primocanes back to 24 to 28 inches in height. Primocanes are the new canes that appear at the beginning of each season and do not produce any fruit. Remove any canes on the blackberry bushes that show signs of damage, such as cracks or breaks, signs of disease, or do not feel as sturdy as the other canes. Canes should also be removed as quickly as possible if they appear to be infested by insects. Prune the blackberry bush again at the end of the growing season, after the last harvest of berries. During the fall pruning, remove all of the canes that produced fruit, which should be evident from the buds left behind on them. Then, cut away most of the first-year primocanes, leaving only five to seven canes. Prune raspberry bushes two or three times each year. 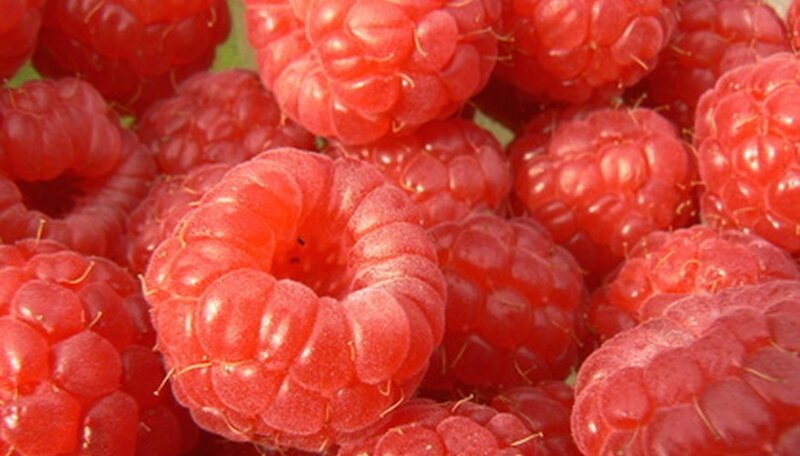 The Horticulture and Crop Science department of Ohio State University recommends pruning red raspberries before the start of the growing season, in late March to early April, and again in the fall after the final harvest, and black or purple bushes once in the middle of March, once in the middle of the summer growing season, and once in the fall. Remove canes from the raspberry bush that do not appear or feel as strong as the other canes. Also, remove canes that have been infested, have become diseased or show signs of physical damage, like cracks. Trim primocanes back during spring pruning. Trim any canes that have grown to a height of more than 5 feet back to between 4-1/2 and 5 feet. All canes should be trimmed back at least 8 inches to help spur new growth. Cut back the canes on black or purple raspberry bushes again during the mid-summer pruning. Black canes should be trimmed to a height of less than 24 inches and purple canes should be trimmed to a height of less than 30 inches. Remove all of the canes that produced fruit during the fall pruning all types of raspberry bushes. The primocanes bear the fruit the following growing season. Some people choose to control the growth of blackberry and raspberry bushes by mowing the bushes down completely every few years. The bushes grow back if mowed down. However, since first year canes do not yield fruit, the blackberry or raspberry bushes won't fruit until the second year of regrowth. Do Raspberry Bushes Have Thorns?